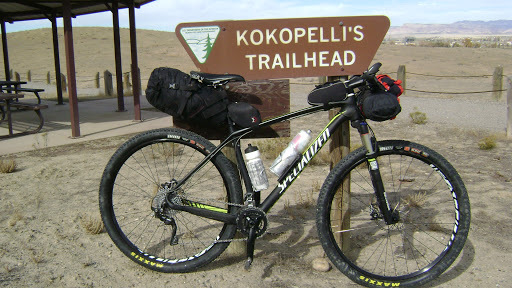 Last week my friend Mike asked if I wanted to partake in bikepacking the Kokopelli’s Trail with him. 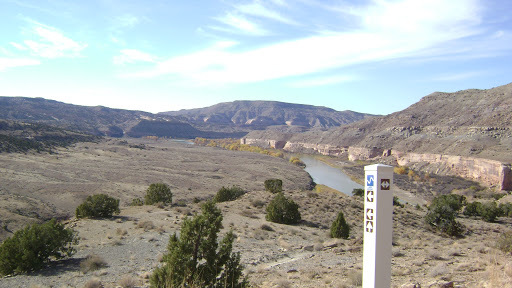 The trail is approximately 142 Miles from Loma, Colorado to Moab, UT. 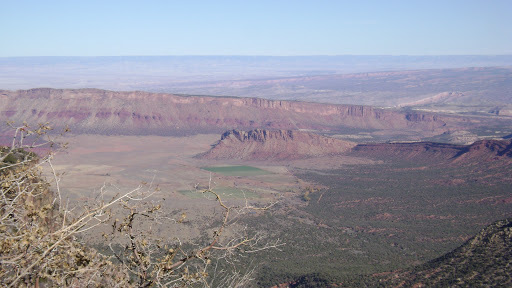 It takes you through large canyons, over desert plains, along the Colorado River, up to the La Sal Mountainrange, and down to Moab. I immediately accepted the invitation and declared it my final hurrah before the ski season ramps up. A few days passed with diligent route and logistic planning, eventually we got everything dialed in. 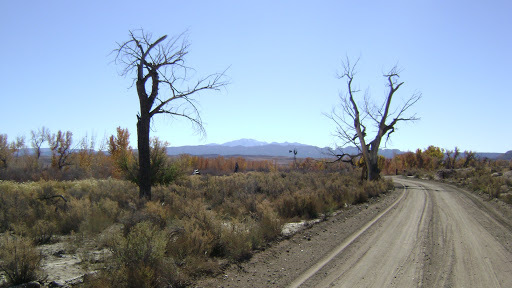 Mike and I would be bikingpacking the Kokopelli’s Trail Monday, October 29th with hopes of finishing on Halloween so we could get back home and maybe have some fun. I work as the Security Supervisor at Crested Butte Mountain Resort and had to work Sunday night until 12:00am. Instead of driving straight after work and sleeping in my car, I decided to sleep at my house for a few hours. I woke up at 3:20am, packed my things and was on the road by 3:40am. Next stop was Gunnison to meet up with Mike and drive our two cars together. We left Gunnison and made our way to Montrose as the moon light illuminated the road. 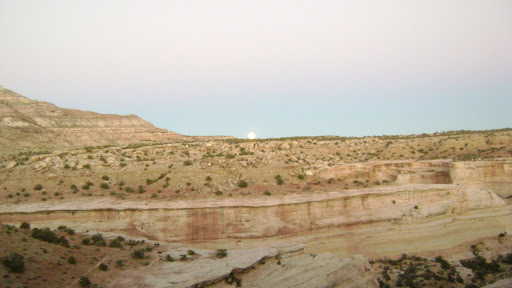 Eventually we would reach Grand Junction and stop at a City Market around 6:30am for camp food, snacks,and two 3–gallon water jugs. Back on the road to Moab by way of Highway 128. Water is the main issue on the Kokopelli’s Trail, depending on the time of the year, some say it is impassible without water drops. After much deliberation and research our hope to do the trailself-supported without a water drop would not happen. It was tough to plan for water as people usually don’t ride the trail this late in the season. Our thought was there might be some water due to the the recent snow fall, but with lack of knowledge of the area we really had no clue. We decided to drop our two large jugs where Onion Creek Road and the Kokopelli’s Trail meet in Fisher Valley as this was a very easy access point for us off Hwy 128. This however would be our only drop of any sort. As we were getting ready to hop in my car with the jugs of water to drive up to Fisher Valley, we noticed Mike’scar was smoking pretty badly. We are no car mechanics but we both knew smoke was not good! When in doubt, add some oil. Both of us had about a quart between our two emergency bottles in our cars. We added the oil and got in my car to drive the 8 or so miles up the road. We got to the junction, dropped the water and drove back down to Hwy 128.Mikes car seemed to be working just fine once we got back, of course, just in time for my check engine light to turn on. Car issues was not the way I had hoped this trip would start. However, my car seemed to be running fine but once we got to Moab I would get it checked out. I made my way to ASAP Automotive to get a computer test done on my car. Luckily, no issues, just a glitch in the computer system, fewef! 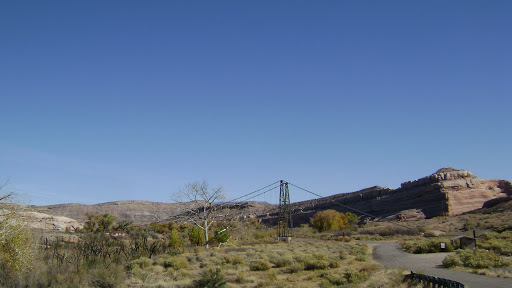 We dropped off Mike’s car and started to head north to I-70 and eventually the Kokopelli’s Trailhead in Loma. It had already been a heck of a dayand we had yet to get in the saddle. 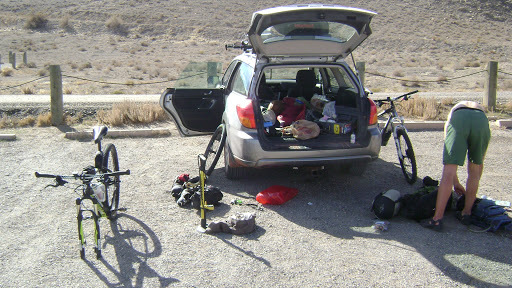 Once we arrived at the Kokopelli‘s Trailhead, we went through our gear, loaded our bikes, and hit the trail at 2:30PM. Our Goal was to make it to Westwater but with the late October sun setting around 6:00pm it would have been hard to muster 40 miles in 3 hours. Even with the late start and early frustration it was hard not to put a smile on our faces once we got on our bikes! It was our first time bikepacking since the Colorado Trail trip in early September. Mike and I were talking about how amazing the feeling is, it’s a whole different style of riding! I’m pretty familiar with the Kokopelli Trail system out of Loma, so it was a fun way to start the trip, Mary’s loop to Lions Loop to Troy Built. All very fun single track that eventually brought us down to Salt Creek. We crossed Salt Creek and instantly our pace slowed with a hike-a-bike section until we got to the top of the ridge. After the hike-a-bike we got on a fast road all the way to the Rabbit Valley Trailhead. After taking a quick break, we continued on some double track, which included sand and rock ledges. 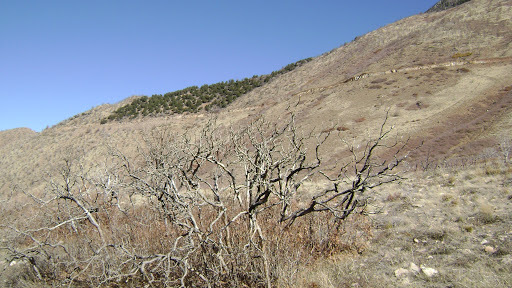 We had also noticed the Western Rim Trail and how fun it looked. I’ve heard the riding in Rabbit Valley is great, but the look of this trail convinced me I would need to return. After wasting some time gazing at the Western Rim Trailand taking some photos we called it a day, overlooking the trail and the beautiful canyon walls! The natural night light of the moon was so bright it created shadows, it was pretty unreal. After some tuna pesto pasta and some other snacks the long day that started at 3:20am was over. We got in our bivys after 30 miles of biking on the day. My watch alarm woke me up at 6:00am the desert wascold and still moonlit. 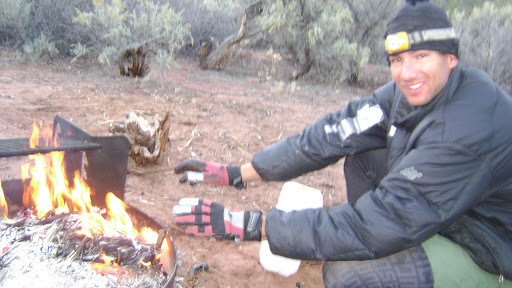 I slowly got out of my bivy and started to boil water for tea and food. Both Mike and I understood we needed to crank out some miles today in order to reach our goal. 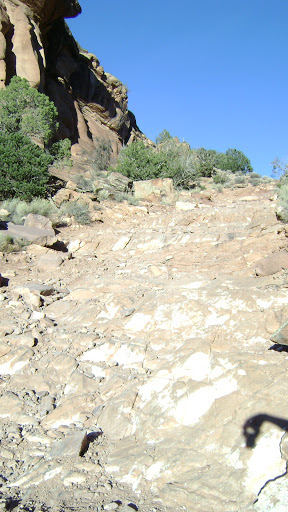 As we hit the trail and started our first climb, a steep and rocky but short climb I had doubts we would reach the goal. I wanted to enjoy myself on the trail but at the same time the ultimate goal was on my mind. Bikepacking makes you think about logistics a lot, at least for me when I’m riding. I have kind of picked up the phrase “not much left to do but keep going” since, it is true until your finished. Once we got to the Westwater paved road we really started to cruise. If the trail calls for paved road while bikepacking, I won’t complain. 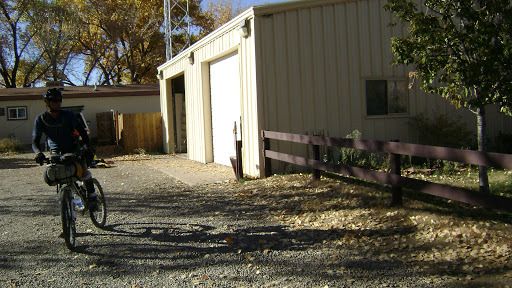 We took a short trip to the Westwater Ranger Station to fill our water at the spigot. We heard about the spigot but we were not sure it would still be on this late in October. It was and we filled up on water and pushed on. The day was getting warmer and we stopped to de-layer. As we did, a Grand Mesa Sheriff drove up to us and asked us if we had seen any vehicles today at all. We had not and told him so. This was the desert, anything goes right? For the next few miles I was thinking what the Sheriff was looking for and hoping we wouldn’t stumble upon any vehicles. Between Westwater and Cicso Boat Ramp there is a whole lot of nothing just plain desert with the occasional nice view, and the riding was very easy. Mike and I did a lot of chatting. After Cisco we got on paved road again, then some more technical riding along McGraw Bottom. We reached Hwy 128 after some spectacular views of the mountains ahead. Because we were in a bind for time we decided to detour around Yellow Jacket Canyon, we had also heard the riding was a bit sandy and not fun. 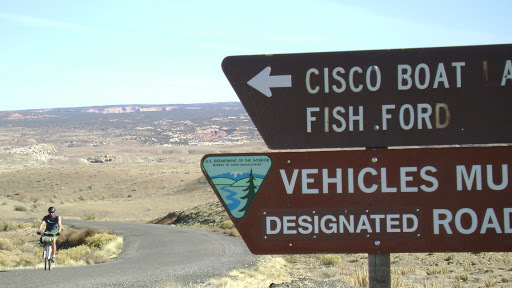 The detour quickly got us to Dewey Bridge, there we took a left on Entrada Bluffs Road. Spirits were super high at first but what we didn’t know was this would be the worst section of the trail, in our opinions. Views were great but around 2:00pm it was like a heat switch turned on. The heat along with the consistent climb up sand and loose rock made it tough going. After the slow climb we finally reached the decent. At first it was a fun little downhill with cool slickrock ledge drops. This got very repetitive and after awhile we made our way to the hardest section of the trail. The crux of the trail, Rose Garden Hill. We were carrying our bikes at one point down Rose Garden Hill. Mike and I were saying how we couldn’t imagine a dirt-bike even trying this. We finally made our way down to Fisher Valley and eventually our water jugs. The sun was setting but we both wanted to make it to Hideout Canyon Campground, so we filled up on water and carried our jugs the 2 miles from Onion Creek Road to Hideout Canyon Campground. We had made it to a very nice campsite, with a toilet, fire rings, and picnic tables, all to ourselves. We got a fire going as we knew it would be a little colder then the previous night. We made a tuna pesto soup with ramen noodles and penne, it hit the spot. we got some good coals going in the fire, hopped in our bivys as the moon lit the earth and shut the eyes after roughly 70 miles of biking on the day. 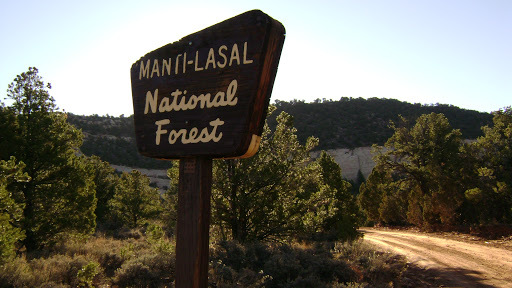 Tomorrow, we hit the LaSals, Moab, and hopefully Home! I woke to my alarm at 5:45am, my sleep was not nearly as sound as the night before. It was a cold morning and I didn’t want to get out of my bivy. I rolled over to my left, grabbed some wood, and rolled back over to my right to put the wood on some buried hot coals. Not until I started a good size fire did I get out of my bivy. My watch said it was 30 degrees. It was slow getting our acts together but if we didn’t have a fire to warm not only our body’s but our spirits it would have been much slower. We got the water ready for what mike calls “rambombs” which is ramen noodles and potato flakes and the occasional summer sausage mixed, it was tasty! We got our things together, huddled around the fire one last time and doused it with our extra water. We knew we had a pretty long climb ahead but were hoping it wouldn’t be as bad as the Dewey Bridge to Fisher Valley section. We hopped on our bikes while our fingers and toes slowly went numb. The sun had yet to hit the north part of the canyon where we were. Once we got to sun the pain from the thaw hurt so good. It had not warmed up too much as we climbed. Ponderosa pines lined the sides of the roads, snow started to fill the shaded areas but the views became increasingly more and more spectacular. We passed paradox trail road and made our way to the top while overlooking Fisher Valley, Surprisingly we never hit any large amounts of snow. We descended from Bull Draw down to Castle Valley Road on a very fast paved road. Just as we were about to start our final climb of the trip we were stunned to see “road closed 1.5 Miles ahead no access to Sand Flats Road.” My stomach dropped, confusion set in. We were hoping this wouldn’t end our trip early. This was one thing we never thought to look into, but once I saw that sign I thought how stupid I was to have not to! We disregarded the initial sign as well as the one 1.5 miles ahead on the road. Once we arrived to the construction we were immediately greeted by some construction jerk. I asked to speak to the foreman as this guy was not the brightest. The foreman was kind and said he has not let anyone through, but said there was a road at the valley floor that would take us around the construction. We thanked him and right there descended down to the valley floor. We scaled down this hill…..how funny! Our so called detour brought us on a very rocky road and eventually back to the paved La Sal Loop Road. Once we got there we knew the top was near so we both pushed it pretty hard. We got to the top and soaked it in! All we had to do now was cruise down Sand Flats Road. I had done the Whole Enchlada last year, so considering our lack of time, we opted to descend down the road. 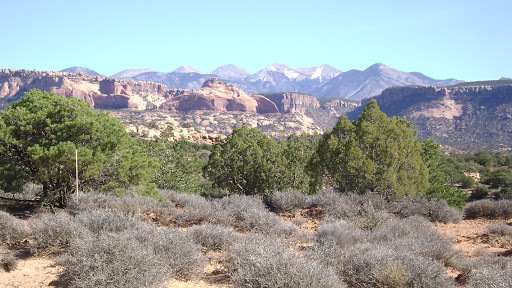 I have only gone as far as the Slickrock Trailhead, and I was blown away by the cool rock formation and beautiful vistas up Sand Flats Road. We descended past Slickrock Trailhead and past what the Latitude 40 Map says the 2nd most beautiful landfill, we thought that was funny. We got to Moab at 2:30pm and went directly to Zax for a burger and a beer! After our meal, we still had to bike to Potash Road to get Mike’s car which was another 8 miles of road riding. We got to Mike’s car pretty quickly, loaded up our stuff, checked the fluids in his car and took off for Loma to pick my car up. After a quick stop in Grand Junction at the Jimmy Johns and Starbucks I hit the road for Crested Butte. I arrived home at 9:45pm put on my costume and went out and had some fun! After it was all said and done we finished the trail in 48 hours, yet we still enjoyed ourselves. I could not have asked for abetter trip this late in October. There is something about bikepacking that feels so right; covering so much ground, carrying all the essentials on your bike, it is truly one of my favorite things to do! I need to thank Rad Anzulovic of 2Pedal Mountain Biking, Rad helped Mike and I with last minute trip planning and convinced us that we needed to do a water drop (so thankful for that). He also sent over his draft of his Kokopelli’s Trail Guide book. It was very easy to use and help tremendously. I cant thank Rad enough for the help, Please check out his web site and look out for the Guide book coming out soon! Also Check out this brief video Mike made using his Go Pro Footage.